By mapping out future grounds care budgets, managers can establish reasonable lifespan expectations for equipment, which in turn will help forecast the need for repairs and, ultimately, replacement. The decision to make major repairs will depend on the specific situation. 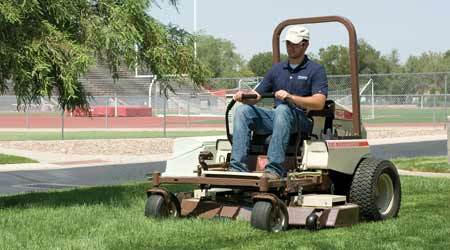 Some larger operations might have full-time mechanics on staff, so it might make sense from a budget standpoint to make repairs that will extend a mower’s performance life. This is particularly true if managers know crews will have downtime during the winter and will need to keep these skilled specialists working during the off season. This approach assumes the mower will continue functioning without disruption the entire season, which, as equipment ages, is not always easy to foresee. Organizations with more modestly staffed grounds departments outsource major repairs, which can result in a substantial expense, which most commonly ends up involving the replacement of a costly major component, such as hydraulic pieces or an engine. Beyond the price of parts and labor, other factors contribute to the total cost of repair. They include mower type, transport options to the service center, the cost of diagnostics, the hourly rate as compared to the industry norm, and whether or not the mower needs additional services while in the shop. Managers should choose a repair center with skilled, experienced mechanics. The equipment guarantee is also important, so make sure to get a written agreement that clearly outlines the guarantee, as well as all services provided and the associated fees, before the work starts. One key question for managers is whether the mower is sound enough to make it worth investing more capital or if it is worn to the point that other expensive repairs are likely to follow in the near future. Managers also need to keep in mind that along with the money spent to make the actual repairs, the added downtime while the mower is in the shop can increase the total cost of ownership and disrupt operations. Managers need to estimate the total number of hours they expect to get out of a mower before facing the decision to either pay for repairs or buy a new mower. Based on recommendations from industry experts, a manager can reasonably estimate a mower engine’s life by knowing the kind of engine and its horsepower. If a mower has an air-cooled engine, multiply its horsepower by 100. This will provide an approximation of the number of many hours to expect to get out of the engine if it is well maintained. Liquid-cooled engines provide more longevity, so multiply the horsepower by 125 to get a lifespan expectation. Comprehensive maintenance will enable managers to get more out of a mower, but for the purposes of determining if it is worth investing more money in, knowing its maintenance and servicing history can make a valuable contribution to the decision-making process. Keep in mind that the engine type also influences maintenance requirements, which affects longevity and the total cost of ownership. Once managers have established the number of hours expected from their mowers, they can compare that to the actual number of hours crews have used the equipment. This is data should be tracked from the day the mower goes into service. Departments can track hours manually, or managers can use software. In fact, many commercial machines feature a built-in system that records this information, making it even easier to track. The key question here is whether the mower is nearing the end of its expected lifespan. If so, it might be time to look at new mowers. In the long run, to keep paying for repairs is to throw good money after bad.